The Universities and Academic Institutions of USA are most sought after destinations among International students. The India-USA ties are friendly hence migration is easy given you are rightly qualified to take a course in a US institution. The major advantage of choosing USA is you can meet fellow Indian students almost everywhere and you won't feel alien in foreign land. The qualifications obtained from a US Academic Institution are recognized world over for the purpose of further studies and employment in the government and private sector. Are you heading to Silicone Valley??? Lucky Fellow Indeed!!! Personally I like UK for pursuing a Master Degree program as it takes only a year to complete while in India one have to spend minimum 2 years. Though there might be exceptions. But who don't like to see Buckingham's Palace? Ties between India and Great Britain are friendly so migration is not very tough for qualified candidates. For Indian students, UK is like a home away from home. Indian students are enrolled in plenty in UK's institutions, they proves helpful to newcomers. You get to know the campus, culture and city better though fellow Indians. Be wise in selecting your destination. A course in a London based institution may cost you twice than a same course in an institution based in Sheffield or Cardiff. Australia is all time hot education destination for Indian students in 2016. One of the big reasons is connections. Australia has Indians in big numbers both in Academic Institutions and outside. A fellow Indian can introduce you to Australia better. Many Australian Universities finds place in Top 100 Global University Rankings. When you migrate to Australia, you get international degree and home like ambiance. Choice of courses is very broad as well as types of qualifications offered, viz; Certificate, Diploma or Degree etc. The big benefit of choosing France as Study Abroad is you don't need to pay any Tuition Fees. French people are very friendly and welcoming by nature. However, French institutions requires to understand the French language so you can stay comfortably, get to know campus and culture better and excel in career path. All sorts of courses are offered, you can chose to complete course work in English. Do you know??? French is called the Language of Love. 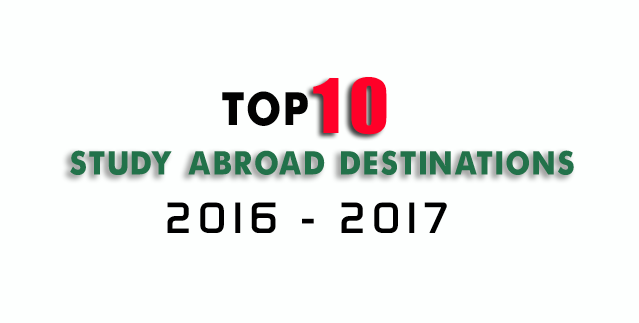 Canada is fast emerging as Study Abroad destination. In recent years country has seen massive increase in number of international students. Some of the popular courses offered are Engineering, Animation, Biotechnology and Hospitality. The Canada's close proximity to USA makes it Hot Education Destination among International students. Are you looking for cheap international education? Russia is the answer for you. Rich in Heritage & Culture, Language & Literature and Science, Engineering & Technology Russia is preferred for study of Medicine, Engineering and Aviation etc. The ties between Indian and Russia are friendly. You will not only get International degree but also enjoy making friends from all over the world while staying in campus. Russian degree, diplomas and certificates are recognized world over for further studies and applying for jobs. Singapore is a home away from for Indian students. Cafes in Singapore are famous for churning out best brains. Grab your laptop, head to any Café in Singapore whether day or night, make presentations, complete college assignments or plan to be next big entrepreneur. People of Singapore are very friendly in nature. Also you will meet there huge pools of Indians. Accommodating to new culture is pretty easy. And when you feel like treating your buds with something home like head to any Indian Restaurant. The New Zealand is emerging as Hot Education Destination for International students. In recent past country has witnessed 400% increase in the enrollment of International students. Whole ranges of courses are available; science, engineering, technology, medicine, hospitality to name a few. To meet study cost you can chose to work part time. Most of the colleges and universities allows for 20 hour work week. Visa procedure is pretty normal, also you can avail scholarships, freeships or study loans. Personally, I am passionate about Max Planck Institute, Munich. I wish I could be there. Now it's your call. Germany is very advanced in modern technologies. You can get to learn whole range of courses from German Academic Institutions viz; arts, humanities, history, mathematics, sciences, engineering, medicine, hospitality etc. Studying in Germany requires you some tongue twisting. Start learning German to qualify for Visa Application. You can pursue a course in English, but knowledge of basic German is required on day to day basis. You can meet many fellow Indian students studying in Germany who will prove helpful in introducing to the new culture. In recent years, German Universities recorded 70% increase in enrollment of Indian students. The Italian Republic has many numbers of institutions to fulfill your appetite for foreign for foreign education. Also Italy is home to huge Indian population along with Chinese, Moroccan and Philippinos etc. Italy welcomes International students with great enthusiasm. You will get to many fellow Indians and Asians inside campus. So setting up in Italy is pretty easy. The University of Bologna in Italy established in 1088 is believed as oldest institutions of the country. Whole range of courses are available through Italian institutes; Arts, Architecture, Mathematics, Sciences, Engineering, Medicine, Hospitality etc. To meet study cost you can avail scholarships and work part time.